Charming, third floor, non-smoking apartment with panoramic view from kitchen, living room and balcony. Tasteful decor and tile floors create a pleasant and warm home. You can watch whales during winter from the spacious balcony and enjoy the incredible view of the protected bay and neighboring islands all year round. People who have stayed here have come back over and over again. Maalaea is central to the island's many attractions. 20 minutes from the airport, 20 minutes to Lahaina, Kahului and the North Shore with it's many windsurfing locations. Shopping is about 20 minutes by car and restaurants are in 5 minutes walking distance. 5 minutes walk in one direction brings you to Maalea's yacht harbor with a small shopping mall and the Maui Ocean Center (Aquarium). 5 minutes walk the other direction will bring you to a 2 mile long sandy beach. We have enjoyed our two week stay in your lovely suite immensely. The view has provided endless hours of entertainment watching all the whale activity and the daily parade of turtles passing us by. We hope to return next year for a longer stay. Your condo is beautiful. The lanai overlooking the ocean is just what the doctor ordered. Relaxing to the sound of the waves or watching a million stars at night. Truely this is a piece of heaven on earth. Thank you for an enjoyable stay! It is very peaceful here away from the crowds but close enough to shop and see some of the exquisit things on the island. We hope we can return another time. Again, thanks for making our stay a pleasure. The soothing sounds of the ocean soon relaxed us into a comfortable, easy life-style. Ten days of rest and sun. The condo was wonderful! The view, both day and night was wonderful as well. The lights in 'Up Country', and across the bay, gave sparkle that was a close second only to the stars above. The perfect winter respite! So much to do and see on this beautiful island but the simple things are still the best - gorgeous sunrises, sounds of the surf, long walks on the beach, whale watching from the lanai, warm golden days, star-studded nights, and even a full moon shimmering all the way across Maalea Bay. Knowing that we were missing Portland's third ice storm this winter made us appreciate our stay here even more. We really enjoyed the condo. Very relaxed and we appreciated the little extras (i.e. boogie board, coolers, iron, etc.). We are planning to come back next year. Hopefully we will be able to get the same condo. Thanks for everything. We are living in Maui since 1993. In 1996 we bought the condo so our family from all over the world can visit, be close to us and enjoy the beautiful location. I work in the public school system as a school based behavioral health counselor and manage the unit after work. I really enjoy having and sharing this beautiful place. In Maalea you can walk everywhere. It is a short walk to the yacht harbor, the ocean center with all the shops, restaurants, etc, and a short walk into the other direction leads to a long beach, stretching all the way to Kihei. Maalea is central to the Island and it is easy to reach many other different beaches, interesting locations and also shopping within a short drive. It is just soooooo relaxing. 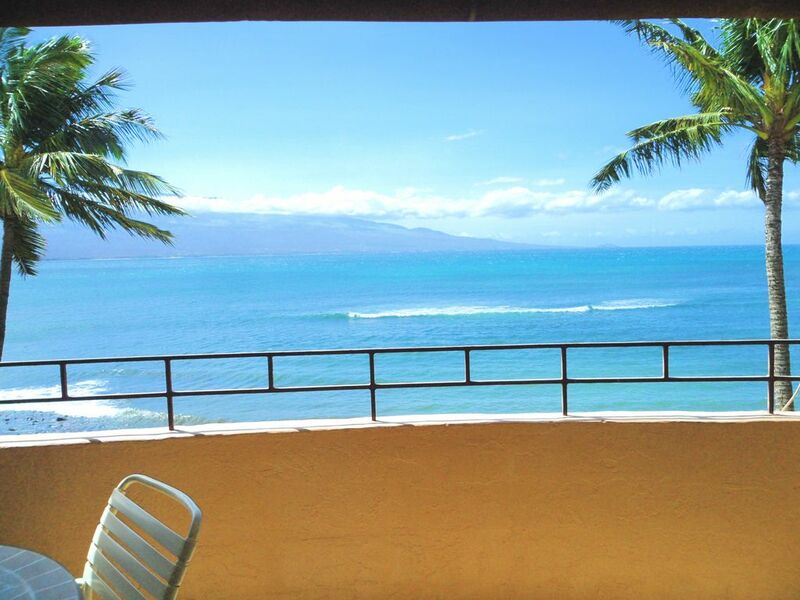 This unit has the most beautiful ocean view from the Lanai. You can watch whales in the winter and all year round see the majestic Haleakala across the bay. We had many family meals right there overlooking the ocean, listening to the movements in the water, looking for turtles with the binoculars that are available also for our guests during their stay. You can watch the whales from the Lanai during Winter season, binoculars are provided in the unit. You can receive calls and make free local calls. For long distance calls you will need to buy your own calling card at local vendors. Convenient location and wonderful view. Needs updating and better pest control. We like staying in Ma'alaea as it is close to everything. The unit is right on the water and you can hear waves crashing 24/7. The owner replaced the broken dishwasher while we were there. The Fridge needs replacing too. The cold spots ruined a lot of our food. The unit is modestly furnished but would benefit greatly from a deep and thorough cleaning including windows. Rugs were filthy and comforter and shams shabby and need replacing. A nice set of glassware and descent cooking utensils would be a huge improvement too. The worst was the german roaches and ghost ant infestation. I was maniacal about keeping crumbs off the counters but still had to kill pests everyday in kitchen, bathroom and living room. The owner was very nice and always got back to me within 24 hours. The daily price reflects the unit condition. You get what you pay for. Great location... patio has beautiful views! As advertised, you can't beat the views from the lanai. You are only a few feet from the waves pounding against the rocks or gently rolling in depending on the time of day. Sea turtles everywhere in the water. The king size bed was very comfortable and the room had everything needed. Washer and dryer was a big plus. The entire complex is a little dated but seemed to be well maintained. This isn't Kaanapali beach but neither is the cost. Centrally located was another plus. Wonderful condo to stay in, the view is definitely worth it. Thank you for the review. I am glad you enjoyed the view, it is very special to us too. Hope you will come our way again in the future. Aloha. Condo worked perfectly for our needs. Thank you for the review, you were wonderful guests to have. Anytime again. Cancellation Policy: Full refund up to 30 days prior to scheduled arrival minus 10% of rental amount. Cancellation within 30 days refund depends on our ability to re-rent the condo.